Here is Phillip. A picture of a smiling boy with a red jumper. Here is a book. A picture of a book. Phillip likes the book. A picture of the smiling boy holding the book. New word: likes. Phillip likes to read. A picture of the smiling boy reading the book. New word: read. ‘I can read the book’ says Phillip. A picture of the smiling boy reading the book. If you recognise this, then you’ll know that the boy’s name was actually Peter, not Phillip. But I thought Peter was pretty much like me. We didn’t have a dog called Pat and I didn’t have a sister called Jane, but the world of the Ladybird Key Words Reading Scheme was very similar to my own. I learnt to read with the set of fifteen or so Key Words books that we had in our house – and my brothers did too. 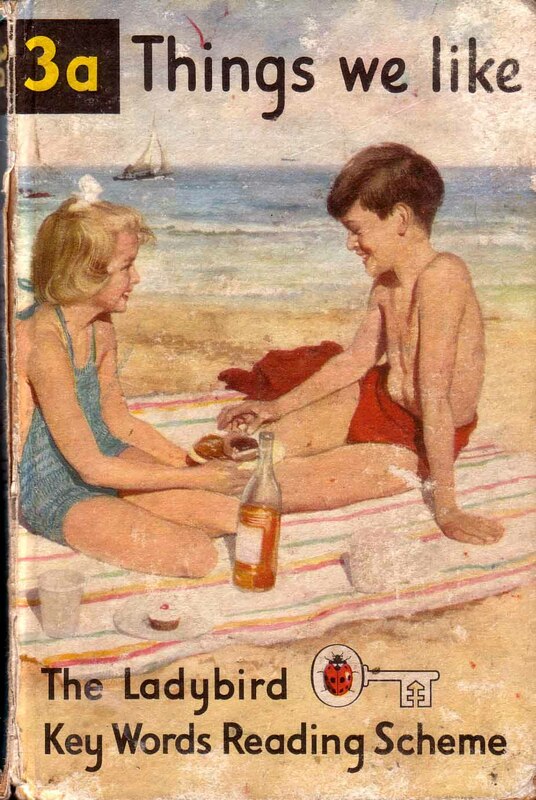 I remember so well the feeling of achievement of getting through the book – 3b, onto 4a, and the list on the back page of all the new words I’d acquired while Pat had been jumping to catch a ball in the garden with Peter and Jane. When I had children, I borrowed the still-bright books from the shelf in Grandma’s house and my kids read to me and my wife just like I’d read to my Mum and Dad. 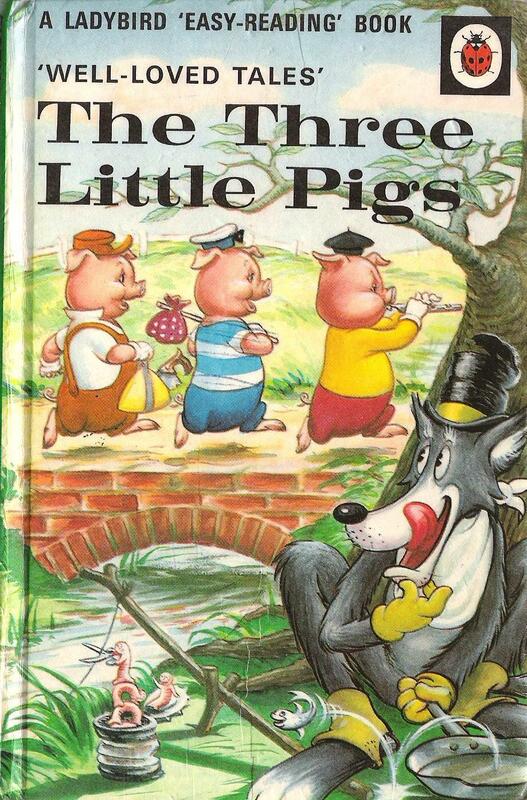 I think it was the simplicity of the Ladybird format that really made these books a great way to learn to read, and the format was used in every Ladybird book, whether it was We Like to Help, The Three Little Pigs or a guide to Butterflies and Moths. Fourty-eight pages, 24 pages with the words on one side, 24 pages with the pictures on the other. And such great pictures – cleverly designed to add to the words, not just to mirror them. Bright colours, like the red of Peter’s jumper or the lemon yellow of Jane’s cardigan and a world where the sun always shone and everything was in order – except if the Police were chasing a robber carrying a large spanner. That was from People at Work – The Police. The pictures are a snapshot of a perfectly ordered, perfectly working post-war Britain and, just like in Martin Parr’s book Boring Postcards you get to see the vision the architects had for their new towns or city centres rebuilt after bombing. I think Ladybird went along with that vision too and thought that their educational books were part of that decent life they wanted their readers to live. It was a fantasy, but it was very enticing. Peter and Jane stand outside an angular plate glass toy shop window in a busy high street – we recognise it as the same street and that same shopfront but now with a graffitied shutter protecting a Bargain Booze store. How I sometimes wish to live in Ladybird-land. In the sense that my childhood world is so different to now and because my Mum looked just like Peter and Jane’s mum, I suppose I did live in Ladybird-land. We weren’t a poor family, but I certainly cherished my small collection of Ladybird books – the back cover always had a listing of ‘Other books in this series’, and there were always around fifteen that I didn’t have. 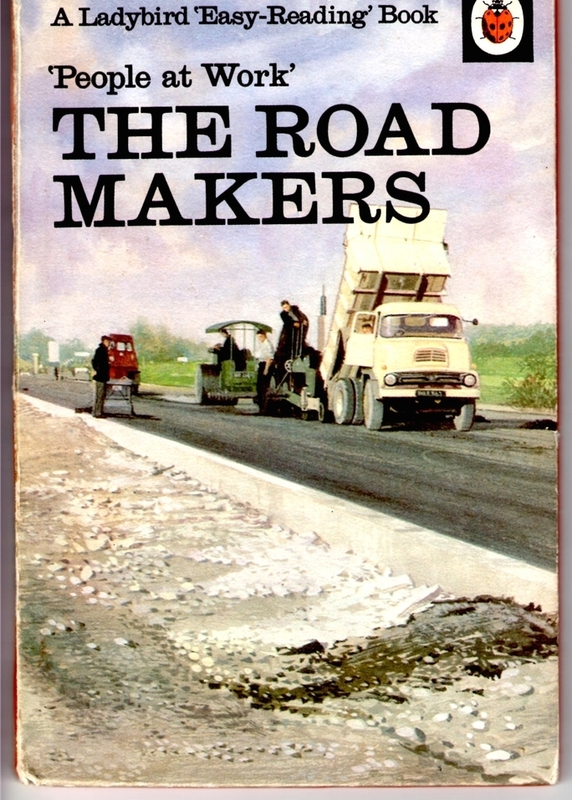 So in the People at Work series I had The Police, The Road Makers and In a Big Store, but not The Lifeboat Men, The Car Makers, The Ship Builders or On the Railways or any of the rest of them. I just read, read and read the same books over and over to the point that I get a funny feeling in my stomach when I see them again. They are like a time portal back to the ten year old version of me and it’s all a bit unsettling. I wondered if some children had all the books in each series – like if some children really had the top of the range Meccano Set No 10 in a three drawer wooden cabinet, or a Lego set where you never ran out of bricks. There’s a shop in Hay-on-Wye which has shelves and shelves of every Ladybird series, every easy-reader, every well-loved tale. I’ve been there twice but never bought a book – there are just too many of them for me to choose just one. Like Meccano, Airfix and Hornby, Ladybird Books belong to a more innocent uncomplicated age, and like lots of other British brands they lost their way and went into a decline in the 1980s. For me, the end came when designs changed to have pictures mixed in with the text across both pages of a spread. It was as if the words on one side, picture on the other format was too old and not interesting enough. By doing this they down-graded both the words and the illustrations. It was an easy mistake to make, but I can only say that when reading these books to my kids, it was so obvious that Ladybird had given up the very thing that made their books so engaging to young children. Ladybird Books are still going – part of Penguin, but they are a different shape and they look just like all the other books now. Even the Ladybird has been redrawn with a pair of cheeky eyes to keep in with the other brands. It’s easy to sound like a grumpy old UKIP supporter here, so I will stop. The Ladybird world reflected a very different Britain – men and women know their place and it’s all hideously white, so things had to change, but I like their unembarrassed wish to educate, I like the fact they valued good design and good illustration, and because of them, I like to read. Phillip Moss is Beci Moss, the LITERATURE Editor’s, favourite dad. Now director, editor, executive producer and all round boss of his media production company Small and Clever, Phillip has worked in the industry since he was 17. 33 years later, a few things have changed, but his love for Oliver Postgate animations, Routemaster Buses and Typography remain strong. He taught his daughter to read with Peter and Jane books, and now, she likes to read too. I read this article and found it very interesting, thought it might be something for you. The article is called Ladybird Key Words – #bedtimestories and is located at http://prancingthroughlife.com/2014/07/09/ladybird-key-words-bedtimestories/.